Texworld USA and Apparel Sourcing USA Winter 2019 edition closed its doors to another highly successful event, taking place last week at the Javits Convention Center in New York City, NY. 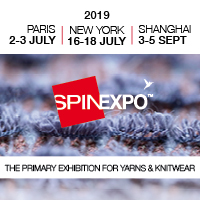 Together, the show connected 330 international suppliers of textiles, trims and accessories, manufacturing and private label development services and finished apparel to a host of industry buyers, designers and experts. Collectively, Texworld USA and Apparel Sourcing USA welcomed more than 4,100 qualified buyers spanning the three days. The two shows received attendees from a total of 70 countries, including France, Australia, Canada, Brazil, India, South Africa, Guatemala, Puerto Rico, Italy, Spain, Argentina, the United Kingdom and more. The two events highlight a broad range of textiles with innovative structures, material mixes and a remarkable array of colour palettes across 16 product categories. This dual platform offers direct access to impressive colour, fabric and trend areas, a strong educational line-up and assortment of industry resources. Texworld‘s educational seminar series, organised by Lenzing Fibers, returned to standing room only sessions. It featured sessions hosted by a curated panels of industry experts who discussed the changing global landscape, sustainable solutions and the trend forecasting. Speakers included Texworld Art Directors, MintModa and the Global Purchasing Companies. More than 10% of suppliers in both events displayed sustainable materials or certifications emphasising their reduced environmental impact in their production and processing. This edition, the show also strengthened its commitment to sustainability through its recycled and repurposed bags. Created from previous edition’s vinyl banners and promotional material, Texworld USA in conjunction with Restore Clothing and CaseNYC, produced nearly a thousand bags. Leading the way, the Lenzing Pavilion hit the show floor with 25 exhibitors showing sustainable fibres in a range of product categories. From cotton and functional fabrics to knits and lace, Lenzing Pavilion exhibitors showcased the best use of sustainable materials in Tencel and Lenzing Modal. Taking a walk down Resource Row led attendees to a multitude of companies sharing their industry tools including trend consultants, fabric recycling companies, technology, fashion consulting, creative learning, workshops, networking and more. Texworld’s USA Trend Showcase curated by Texworld’s Art Directors Louis Gerin and Gregory Lamaud hit the show floor with a unique and creative flair, showcasing their vision and expertise for the upcoming season. Excitement flourished as attendees viewed the featured fabrics from select companies exhibiting at the show, as well as the inspiration behind the vision: At the Source. Visitors also had the opportunity to preview the newest colours and textile offerings for the Spring/Summer 2019/20 season.